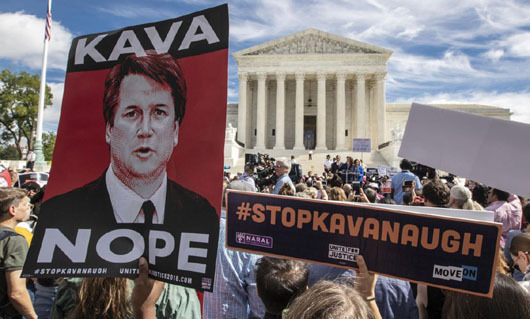 MoveOn.org, which is heavily funded by leftist billionaire George Soros, and Planned Parenthood are targeting key senators as they continue to press to derail the nomination of Brett Kavanaugh to the Supreme Court. Planned Parenthood, in a tweet on Oct. 4 (which was National Poetry Day), said: “Roses are red, violets are blue, senators vote NO on #Kavanaugh, or else we’re coming for you”. Planned Parenthood urged its supporters to contact four senators who are considered to be swing votes: Collins, Alaska Republican Lisa Murkowski, Arizona Republican Jeff Flake, and West Virginia Democrat Joe Manchin. Senate Judiciary Chairman Chuck Grassley said in a statement on Oct. 4 that the new FBI report has revealed “no hint” of sexual misconduct and that “it’s time to vote” to confirm Kavanaugh. Activist Robert Reich, who served as Bill Clinton’s Secretary of Labor, sent out a blast email on behalf of MoveOn.org asking for donations: “Will you chip in $3 right now and help support MoveOn’s emergency campaign to stop Brett Kavanaugh?” the email asked. “If this isn’t a sham investigation, I don’t know what is,” Reich wrote of the wrapped-up FBI investigation which Democrats had long demanded. Breitbart News reported that, along with funding from Soros, MoveOn.org has also been financed by the Tides Foundation, a leftist sponsorship organization that has itself received donations from Soros and has partnered with Soros’s Open Society Foundations.